Once again it’s that beautiful time of year when spring comes and we celebrate the birth of the Khalsa (Vaisakhi). This is the time when Guru Gobind Singh established the Khalsa and we all became Singh’s and Kaurs. I would like to welcome you all to join in the celebration of Vaisakhi virtually through the internet this Sunday, April 12th 2009. Every year a huge Vaisakhi celebration takes place at the Los Angeles convention center followed by a large Nagar Kirtan through the streets of downtown Los Angeles. Every year we broadcast this event live on SikhNet for all to participate. We will also be doing a live broadcast of the Baisakhi Gurdwara happening at the same time in Espanola, New Mexico. If there are other live broadcasts going on at the same time please let me know so I can include it on the page. 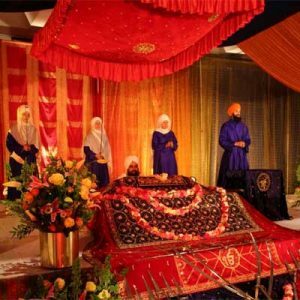 Go to SikhNet for more information and to watch the broadcast. Thanks for sharing the link! I’ts a nice program, very soothing to listen too.. I missed watching the Vaisakhi celebrations in LA online due the time difference. Is there a recorded version that I could watch? Would appreciate if that is available.